For the macOS version of the app store, see App Store (macOS). For the general concept, see App store. The App Store was opened on July 10, 2008, with an initial 500 applications available. As of 2017[update], the store features over 2.1 million apps. After the success of Apple's App Store and the launch of similar services by its competitors, the term "app store" has been adopted to refer to any similar service for mobile devices. However, Apple applied for a U.S. trademark on the term "App Store" in 2008, which was tentatively approved in early 2011. In June 2011, U.S. District Judge Phyllis Hamilton, who was presiding over Apple's case against Amazon, said she would "probably" deny Apple's motion to stop Amazon from using the "App Store" name. In July, Apple was denied preliminary injunction against Amazon's Appstore by a federal judge. The term app has become a popular buzzword; in January 2011, app was awarded the honor of being 2010's "Word of the Year" by the American Dialect Society. "App" has been used as shorthand for "application" since at least the mid-1990s, and in product names since at least 2006, for example then-named Google Apps. Apple announced Mac App Store, a similar app distribution platform for its macOS personal computer operating system, in October 2010, with the official launch taking place in January 2011 with the release of its 10.6.6 "Snow Leopard" update. In February 2013, Apple informed developers that they could begin using appstore.com for links to their apps. In June at its developer conference, Apple announced an upcoming "Kids" section in App Store, a new section featuring apps categorized by age range, and the section was launched alongside the release of iOS 7 in September 2013. In November 2014, due to pressure from the European Commission, Apple updated App Store so that all apps that have no charge to download are labeled "Get" instead of the previous "Free", due to many "free" apps' inclusions of paid in-app purchases. In January 2017, reports surfaced that documentation for a new beta for the then-upcoming release of iOS 10.3 detailed that Apple would let developers respond to customer reviews in the App Store, marking a significant change from the previous limitation, which prevented developers from communicating with users. The functionality was officially enabled on March 27, 2017 when iOS 10.3 was released to users. Further details were also released about reviews for users, including that they will be able to rate and review apps in the apps themselves rather than being redirected to the App Store, and that they can mark other users' reviews as "Helpful" or "Not Helpful". Apple published a document describing proper ways to respond for developers, including being timely, clear and concise, prioritize certain forms of reviews (low-star ratings, certain countries or recent reviews) through filtering in iTunes Connect, and that developer responses go through an approval process before being published. Developers are also forbidden from manipulating or incenting feedback. Developer responses are listed in the App Store as a line underneath the respective user's review, and users receive a notification/email upon a response from the respective developer, with the option to update their review. In March 2017, App Store submissions containing pricing details, such as "free", in the name started getting rejected. Developers had previously been advised in developer guides in iTunes Connect and App Store overview pages that they should refrain from the practice, though apps were still approved. Starting in March, some (though not all) apps with "free" in their titles were being rejected. In October 2016, in an effort to improve app discoverability, Apple rolled out the ability for developers to purchase advertising spots in App Store to users in the United States. The ads, shown at the top of the search results, are based strictly on relevant keywords, and are not used to create profiles on users. Apple expanded search ads to the United Kingdom, Australia and New Zealand in April 2017, along with more configurable advertising settings for developers. Search ads were expanded to Canada, Mexico and Switzerland in October 2017. In December 2017, Apple revamped its search ads program to offer two distinctive versions; "Search Ads Basic" is a pay-per-install program aimed at smaller developers, in which they only pay when users actually install their app. Search Ads Basic also features an easier setup process and a restricted monthly budget. "Search Ads Advanced" is a new name given to the older method, in which developers have to pay whenever users tap on their apps in search results, along with unlimited monthly budgets. At launch, the Basic program is only available in the U.S., with international rollout expected "sometime next year". Apple also offers an iTunes Affiliate Program, which lets people refer others to apps and other iTunes content, along with in-app purchases, for a percentage of sales. The commission rate for in-app purchases was reduced from 7% to 2.5% in May 2017, while affiliate rates for paid apps, music, movies, books, and TV shows remained at 7%. App Store received a major design overhaul with the release of iOS 11. The new design features a greater focus on editorial content and daily highlights, and introduces a "cleaner and more consistent and colorful look" similar to several of Apple's built-in iOS apps. Prior to September 2017, Apple offered a way for users to manage their iOS app purchases through the iTunes computer software. In September, version 12.7 of iTunes was released, removing the App Store section in the process. However, the following month, iTunes 12.6.3 was also released, retaining the App Store, with 9to5Mac noting that the secondary release was positioned by Apple as "necessary for some businesses performing internal app deployments". In December 2017, Apple announced that developers could offer applications for pre-order, letting them make apps visible in the store between 2–90 days ahead of release. To publish apps on App Store, developers must pay a $99 yearly fee for access to Apple's Developer Program. Apple has announced that, in the United States in 2018, it will waive the fee for nonprofit organizations and governments. Developers have a few options for monetizing their applications. The "Free Model" enables free apps, increasing likelihood of engagement. The "Freemium Model" makes the app download free, but users are offered optional additional features in-app that require payments. The "Subscription Model" enables ongoing monetization through renewable transactions. The "Paid Model" makes the app itself a paid download and offers no additional features. The "Paymium Model" enables paid app downloads and paid in-app content. In-app subscriptions were originally introduced for magazines, newspapers and music apps in February 2011, giving developers 70% of revenue earned and Apple 30%. Publishers could also sell digital subscriptions through their website, bypassing Apple's fees, but were not allowed to advertise their website alternative through the apps themselves. In 2016, multiple media outlets reported that apps had decreased significantly in popularity. Recode wrote that "The app boom is over", an editorial in TechCrunch stated that "The air of hopelessness that surrounds the mobile app ecosystem is obvious and demoralizing", and The Verge wrote that "the original App Store model of selling apps for a buck or two looks antiquated". Issues included consumer "boredom", a lack of app discoverability, and, as stated by a report from 2014, a lack of new app downloads among smartphone users. In an interview with The Verge in June 2016, Phil Schiller, Apple's senior vice president of Worldwide Marketing, said that Apple had a "renewed focus and energy" on the App Store, and announced multiple significant changes, including advertisements in search results and a new app subscription model. The subscription model saw the firmly established 70/30 revenue split between developers and Apple change into a new 85/15 revenue split if a user stays subscribed to the developer's app for a year, and opens the possibility of subscriptions to all apps, not just select categories. App data and insights analyst company App Annie released a report in October 2016, announcing that China had overtaken the United States as Apple's biggest market in App Store revenue. In the third quarter of 2016, Chinese users spent $1.7 billion vs. approximately $1.5 billion by American users. In June 2017, Apple announced that App Store had generated over $70 billion in revenue for developers since its 2008 launch. On July 10, 2008, Apple's then-CEO Steve Jobs told USA Today that App Store contained 500 third-party applications for the iPhone and the iPod Touch, and of these 25 percent were free. Ten million applications were downloaded the first weekend. By September, the number of available apps had increased to 3,000, with over 100 million downloads. App Store app availability has increased in line with downloads over time. Over the years, the store has surpassed multiple major milestones, including 50,000, 100,000, 250,000, 500,000, 1 million, and 2 million apps. The billionth application was downloaded on April 24, 2009. The iPad was released in April 2010, with approximately 3,000 apps available. By July 2011, 16 months after the release, there were over 100,000 apps available designed specifically for the device. Apple publishes a list on a yearly basis, giving credit to the apps with the highest number of downloads in the past year. These are the most-downloaded iOS applications and the highest revenue generating iOS applications of all time from 2010-2018. As of 2013[update], Apple employed mostly static analysis for their app review process, which means that dynamic code reassembly techniques could defeat the review process. In June 2017, Apple updated its App Store review guidelines to specify that app developers will no longer have the ability to use custom prompts for encouraging users to leave reviews for their apps. With the release of iOS 11 in late 2017, Apple will also let developers choose whether to keep current app reviews when updating their apps or to reset. Additionally, another update to App Store policies allows users to optionally "tip" content creators, by voluntarily sending them money. In November 2012, Boyfriend Maker, a dating sim game, was removed due to "reports of references to violent sexual acts and paedophilia" deemed inappropriate to Boyfriend Maker's age rating of 4+. A revised version called Boyfriend Plus was approved by Apple in April 2013. In March 2013, HiddenApps was approved and appeared in App Store. The app provided access to developer diagnostic menus, allowed for stock apps to be hidden, and enabled an opt-out feature for iAds, Apple's developer-driven advertisement system. The app was removed shortly afterwards for violating guidelines. In April 2013, Apple removed AppGratis, a then-successful app store market that promoted paid apps by offering one for free each day. Apple told All Things Digital that the app violated two of its developer agreement clauses, including "Apps that display Apps other than your own for purchase or promotion in a manner similar to or confusing with the App Store will be rejected" and "Apps cannot use Push Notifications to send advertising, promotions, or direct marketing of any kind". Apple did, however, tell the developers they were "welcome to resubmit" after changing the app, though there was "not much hope that it could survive in anything like its current incarnation". In November 2014, Apple removed the marijuana social networking app MassRoots, with the reason given that it "encourage[d] excessive consumption of alcohol or illegal substances.” In February 2015, MassRoots was reintroduced into the store after Apple changed its enforcement guidelines to allow cannabis social apps in the 23 states where it is legal. In September 2015, it was discovered that "hundreds" of apps submitted and approved on App Store were using XcodeGhost, a malicious version of the Xcode development software. The issues prompted Apple to remove infected apps from the store and issue a statement that it was "working with the developers to make sure they’re using the proper version of Xcode". A security firm later published lists of infected apps, including a China-only version of Angry Birds 2, CamCard, Lifesmart, TinyDeal.com, and WeChat. In the aftermath, Apple stated that it would make Xcode faster to download in certain regions outside the United States, and contacted all developers to ensure they only download the code from the Mac App Store or Apple's website, and provided a code signature for developers to test if they are running a tampered version of Xcode. In June 2017, a scamming trend was discovered on the store, in which developers make apps built on non-existent services, attach in-app purchase subscriptions to the opening dialogue, then buy App Store search advertising space to get the app into the higher rankings. In one instance, an app by the name of "Mobile protection :Clean & Security VPN" would require payments of $99.99 for a seven-day subscription after a short trial. Apple has not yet responded to the issues. In addition, Apple has removed software licensed under the GNU General Public License (GPL) from App Store, due to text in Apple's Terms of Service agreement imposing digital rights management and proprietary legal terms incompatible with the terms of the GPL. On September 1, 2016, Apple announced that starting September 7, it would be removing old apps that do not function as intended or that don't follow current review guidelines. Developers will be warned and given 30 days to update their apps, but apps that crash on startup will be removed immediately. Additionally, app names registered by developers cannot exceed 50 characters, in an attempt to stop developers from inserting long descriptions or irrelevant terms in app names to improve the app's ranking in App Store search results. App intelligence firm Sensor Tower revealed in November 2016 that Apple, as promised from its September announcement of removing old apps, had removed 47,300 apps from App Store in October 2016, a 238 percent increase of its prior number of average monthly app removals. In June 2017, TechCrunch reported that Apple had turned its app removal focus on apps copying functionality from other, popular apps. An example cited included "if a popular game like Flappy Bird or Red Ball hits the charts, there will be hundreds or thousands of clones within weeks that attempt to capitalize on the initial wave of popularity". The report also noted removals of music apps serving pirated tracks. The publication wrote that, since the initial September app removals began, Apple had removed "multiple hundreds of thousands" of apps. In December 2017, a new report from TechCrunch stated that Apple had begun enforcing new restrictions on the use of "commercialized template or app generation services". Originally introduced as part of Apple's 2017 developer conference, new App Store guidelines allow the company to ban apps making use of templates or commercial app services. This affected many small businesses, with TechCrunch's report citing that "local retailers, restaurants, small fitness studios, nonprofits, churches and other organizations" benefit from using templates or app services due to minimal costs. Developers had received notice from Apple with a January 1, 2018 deadline to change their respective apps. The news caught the attention of Congress, with Congressman Ted Lieu writing a letter to Apple at the beginning of December, asking it to reconsider, writing that "It is my understanding that many small businesses, research organizations, and religious institutions rely on template apps when they do not possess the resources to develop apps in-house", and that the new rules cast "too wide a net", specifically "invalidating apps from longstanding and legitimate developers who pose no threat to the App Store’s integrity". Additionally, the news of stricter enforcement caused significant criticism from app development firms; one company told TechCrunch that it chose to close down its business following the news, saying that "The 4.2.6 [rule enforcement] was just a final drop that made us move on a bit faster with that decision [to close]", and another company told the publication that "There was no way in June [when the guidelines changed] that we would have said, ‘that’s going to target our apps' ... Apple had told us you aren’t being targeted by this from a quality standpoint. So being hit now under the umbrella of spam is shocking to every quality developer out there and all the good actors". Furthermore, the latter company stated that "there’s only so much you can do with apps that perform the same utility – ordering food". A third company said that "Rule 4.2.6 is a concrete illustration of the danger of Apple’s dominant position", and a fourth said that "They’ve wiped out pretty much an entire industry. Not just DIY tools like AppMakr, but also development suites like Titanium". Towards the end of the year, Apple updated the guideline to clarify that companies and organizations are allowed to use template apps, but only as long as they directly publish their app on their own; it remained a violation of the rule for commercial app services to publish apps for the respective clients. In January 2017, Apple complied with a request from the Chinese government to remove the Chinese version of The New York Times' app. This followed the government's efforts in 2012 to block the Times' website after stories of hidden wealth among family members of then-leader of China, Wen Jiabao, were published. In a statement, an Apple spokesperson told the media that "we have been informed that the app is in violation of local regulations", though would not specify which regulations, and added that "As a result the app must be taken down off the China app store. When this situation changes the app store will once again offer the New York Times app for download in China". The following July, it was reported that Apple had begun to remove listings in China for apps that circumvent government Internet censorship policies and new laws restricting virtual private network (VPN) services. Apple issued a statement, explaining that the app removals were a result of developers not complying with new laws in China requiring a government license for businesses offering VPNs, and that "These apps remain available in all other markets where they do business". In an earnings call the following month, Cook elaborated on the recent news, explainining that "We would obviously rather not remove the apps, but like we do in other countries, we follow the law wherever we do business". Besides VPN services, a number of Internet calling apps, including Microsoft's Skype, were also removed from the Chinese App Store in 2017, with Apple telling The New York Times that, similar to the VPN apps, these new apps also violated local law. Microsoft explained to BBC News that its Skype app had been "temporarily removed" and that it was "working to reinstate the app as soon as possible", though many news outlets reported on the Chinese government's increased efforts and pressure to crack down on Internet freedom. Following Apple CEO Tim Cook's appearance at China's World Internet Conference in December 2017, in which Cook stated that Apple and China share a vision of "developing a digital economy for openness and shared benefits", free speech and human rights activists criticized Cook and the company. Maya Wang at Human Rights Watch told The Washington Post that "Cook’s appearance lends credibility to a state that aggressively censors the internet, throws people in jail for being critical about social ills, and is building artificial intelligence systems that monitors everyone and targets dissent. ... The version of cyberspace the Chinese government is building is a decidedly dystopian one, and I don’t think anyone would want to share in this ‘common future.’ Apple should have spoken out against it, not endorsed it." U.S. Senator Patrick Leahy told CNBC that "American tech companies have become leading champions of free expression. But that commitment should not end at our borders. ... Global leaders in innovation, like Apple, have both an opportunity and a moral obligation to promote free expression and other basic human rights in countries that routinely deny these rights." Cook told Reuters that "My hope over time is that some of the things, the couple of things that’s been pulled, come back. I have great hope on that and great optimism on that". However, TechCrunch's Jon Russell criticized this line of thinking, writing that "Firstly, Apple didn’t just remove a "couple of things" from the reach of China-based users", but rather "a couple of hundred" apps, acknowledging that "even that is under counting". Furthermore, Russell listed censorship efforts by the Chinese government, including VPN bans and restrictions on live video and messaging apps, and wrote that "Apple had little choice but to follow Beijing’s line in order to continue to do business in the lucrative Chinese market, but statements like Cook’s today are dangerous because they massively underplay the severity of the situation". Florida Senator Marco Rubio also criticized Cook's appearance at the World Internet Conference, describing the situation as "here’s an example of a company, in my view, so desperate to have access to the Chinese market place that they are willing to follow the laws of that country even if those laws run counter to what those companies’ own standards are supposed to be". In August 2018, as a result of Chinese regulations, 25,000 illegal apps were pulled down by Apple from the App Store in China. ^ "Apple's App Store launches with more than 500 apps". AppleInsider. July 10, 2008. Retrieved March 31, 2017. ^ Bonnington, Christina (July 10, 2013). "5 Years On, the App Store Has Forever Changed the Face of Software". Wired. Condé Nast. Retrieved March 31, 2017. ^ a b c d Ricker, Thomas (July 10, 2008). "Jobs: App Store launching with 500 iPhone applications, 25% free". Engadget. AOL. Retrieved March 29, 2017. ^ "Apple Introduces the New iPhone 3G". Apple Press Info. Apple Inc. June 9, 2008. Retrieved March 31, 2017. ^ Miller, Paul (June 9, 2008). "iPhone 3G is finally official, starts at $199, available July 11th". Engadget. AOL. Retrieved March 31, 2017. ^ Carew, Sinead (April 22, 2009). "In app store war, BlackBerry, Google hold own". Reuters. Thomson Reuters. Retrieved March 31, 2017. ^ Furchgott, Roy (May 29, 2009). "Nokia's App Store Launches With a Hiccup". The New York Times. Retrieved March 31, 2017. ^ Ganapati, Priya (March 4, 2009). "BlackBerry App Store Gets a Name". Wired. Condé Nast. Retrieved March 31, 2017. ^ Dignan, Larry (March 22, 2011). "Apple's App Store and a little trademark history". ZDNet. CBS Interactive. Retrieved March 31, 2017. ^ Pachal, Peter (April 1, 2011). "How Apple Can Trademark 'App Store'". PC Magazine. Ziff Davis. Retrieved March 31, 2017. ^ Lowensohn, Josh (June 22, 2011). "Judge likely to deny Apple's 'Appstore' complaint". CNET. CBS Interactive. Retrieved March 31, 2017. ^ Rosenblatt, Joel; Gullo, Karen (June 22, 2011). "Apple Bid to Bar Amazon 'Appstore' Will 'Likely' Be Denied". Bloomberg Businessweek. Bloomberg L.P. Archived from the original on June 24, 2011. Retrieved March 31, 2017. ^ Levine, Dan; Gupta, Poornima (June 22, 2011). "Apple may have tough road in Amazon lawsuit". Reuters. Thomson Reuters. Retrieved March 31, 2017. ^ Foresman, Chris (July 7, 2011). "Apple denied preliminary injunction against Amazon's "Appstore"". Ars Technica. Condé Nast. Retrieved March 31, 2017. ^ ""App" voted 2010 word of the year by the American Dialect Society (UPDATED)". American Dialect Society. January 7, 2011. Retrieved April 1, 2017. ^ Fink, Cody (January 13, 2011). "App Is 2010's Word Of The Year". MacStories. Retrieved April 1, 2017. ^ "Oracle gets NC religion". CNET. CBS Interactive. February 27, 1996. Retrieved April 1, 2017. ^ "Google Launches Hosted Communications Services". News from Google. Google. August 28, 2006. Retrieved April 1, 2017. ^ Fried, Ina (October 20, 2010). "Apple unveils new MacBook Airs, previews Lion". CNET. CBS Interactive. Retrieved April 1, 2017. ^ Miller, Ross (October 20, 2010). "Mac App Store for OS X 10.6 and 10.7 unveiled, coming 'within 90 days'". Engadget. AOL. Retrieved April 1, 2017. ^ "The Mac App Store: What you need to know". Macworld. International Data Group. January 6, 2011. Retrieved April 1, 2017. ^ "Apple's Mac App Store Opens for Business". Apple Press Info. Apple Inc. January 6, 2011. Retrieved April 1, 2017. ^ Thomas, Owen (February 4, 2013). "Apple Does Not Want You To Visit Appstore.com". Business Insider. Axel Springer SE. Retrieved April 1, 2017. ^ Perez, Sarah (February 3, 2013). "Apple Debuts New AppStore.com Vanity URLs For Developers During Super Bowl". TechCrunch. AOL. Retrieved April 1, 2017. ^ Foresman, Chris (February 4, 2013). "Apple debuts new AppStore.com URLs during Super Bowl 47". Ars Technica. Condé Nast. Retrieved April 1, 2017. ^ Perez, Sarah (September 22, 2013). "Introducing Apple's New "Kids" App Store". TechCrunch. AOL. Retrieved April 1, 2017. ^ Guarino, Sarah (September 19, 2013). "App Store makes it easier for parents to find apps for their children with new Kids Category in iOS 7". 9to5Mac. Retrieved April 1, 2017. ^ Perez, Sarah (November 19, 2014). "Apple Relabels "Free" Download Buttons On iTunes And Mac App Store To "Get" Following Pressure from EC". TechCrunch. AOL. Retrieved April 1, 2017. ^ Clover, Juli (November 19, 2014). "Apple Replaces 'Free' Purchase Button Labeling With 'Get' in App Store". MacRumors. Retrieved April 1, 2017. ^ Brian, Matt (November 20, 2014). "Why App Store apps are now labeled 'Get' instead of 'Free'". Engadget. AOL. Retrieved April 1, 2017. ^ Perez, Sarah (January 24, 2017). "Apple will finally let developers respond to App Store reviews". TechCrunch. AOL. Retrieved March 29, 2017. ^ Mayo, Benjamin (January 24, 2017). "Apple will let developers reply to reviews in the App Store soon, for iOS and Mac apps". 9to5Mac. Retrieved March 29, 2017. ^ Clover, Juli (March 27, 2017). "Apple Releases iOS 10.3 With Find My AirPods, APFS, App Store Review Tweaks and More". MacRumors. Retrieved March 29, 2017. ^ a b c d e Perez, Sarah (March 28, 2017). "Developers can finally respond to App Store reviews – here's how it works". TechCrunch. AOL. Retrieved March 29, 2017. ^ Miller, Chance (March 27, 2017). "Apple details new App Store ratings and review responses on iOS 10.3 for developers". 9to5Mac. Retrieved March 29, 2017. ^ Novet, Jordan (March 28, 2017). "Apple now rejects App Store submissions when the name includes the price". VentureBeat. Retrieved April 19, 2017. ^ Clover, Juli (March 28, 2017). "Apple Rejecting Apps With Pricing Info Like 'Free' in App Title". MacRumors. Retrieved April 19, 2017. ^ Hardwick, Tim (October 6, 2016). "Ads Now Appearing in App Store Search Results for U.S. Users". MacRumors. Retrieved December 6, 2017. ^ Vincent, James (October 6, 2016). "Apple starts showing ads in App Store search results". The Verge. Vox Media. Retrieved December 6, 2017. ^ Novet, Jordan (October 5, 2016). "Apple starts showing App Store search ads in the U.S." VentureBeat. Retrieved December 6, 2017. ^ a b Goode, Lauren (June 8, 2016). "App Store 2.0". The Verge. Vox Media. Retrieved March 29, 2017. ^ Barbosa, Greg (April 19, 2017). "App Store Search Ads expand internationally with new campaign tools". 9to5Mac. Retrieved December 6, 2017. ^ Campbell, Mikey (April 19, 2017). "Apple to expand Search Ads to three international markets, debuts new management tools". AppleInsider. Retrieved December 6, 2017. ^ Potuck, Michael (October 10, 2017). "App Store Search Ads go live today in Canada, Mexico, and Switzerland". 9to5Mac. Retrieved December 6, 2017. ^ Perez, Sarah (December 5, 2017). "Apple introduces a new pay-per-install ad product called Search Ads Basic". TechCrunch. Oath Inc. Retrieved December 6, 2017. ^ Clover, Juli (December 5, 2017). "Apple Adds New 'Search Ads Basic' Ad Option for Developers". MacRumors. Retrieved December 6, 2017. ^ "Apple confirms reduced App Store affiliate commission rates apply to in-app purchases". AppleInsider. May 8, 2017. Retrieved May 9, 2017. ^ Miller, Chance (May 7, 2017). "Apple clarifies iTunes affiliate changes: apps stay at 7% & in-app purchases fall to 2.5%". 9to5Mac. Retrieved May 9, 2017. ^ Vincent, James; Statt, Nick (June 5, 2017). "Apple unveils redesigned App Store with an all-new way to find apps and games". The Verge. Vox Media. Retrieved June 6, 2017. ^ Broussard, Mitchel (June 5, 2017). "Apple Reveals Redesigned App Store for iOS 11 With Design Similar to Apple Music". MacRumors. Retrieved June 6, 2017. ^ Perez, Sarah (June 5, 2017). "Apple introduces a completely redesigned App Store". TechCrunch. AOL. Retrieved June 6, 2017. ^ Welch, Chris (September 12, 2017). "Apple starts cutting the bloat from iTunes by removing iOS App Store". The Verge. Vox Media. Retrieved December 16, 2017. ^ Miller, Chance (December 11, 2017). "App Store now lets any developer make apps available for pre-order". 9to5Mac. Retrieved December 12, 2017. ^ Clover, Juli (December 11, 2017). "Apple Now Allowing Developers to Offer App Pre-Orders". MacRumors. Retrieved December 12, 2017. ^ "App Store kicks off 2018 with record-breaking holiday season". Apple Newsroom. Retrieved January 5, 2018. ^ a b "Jobs' original vision for the iPhone: No third-party native apps". 9to5Mac. October 21, 2011. Retrieved June 21, 2017. ^ Duncan, Geoff (October 17, 2007). "Apple confirms iPhone SDK coming next year". Digital Trends. Retrieved June 21, 2017. ^ "Steve Jobs confirms native iPhone SDK by February". AppleInsider. October 17, 2007. Retrieved June 21, 2017. ^ Dalrymple, Jim (March 6, 2008). "Apple unveils iPhone SDK". Macworld. International Data Group. Retrieved June 21, 2017. ^ Block, Ryan (March 6, 2008). "Live from Apple's iPhone SDK press conference". Engadget. AOL. Retrieved June 21, 2017. ^ a b c Guevin, Jennifer (March 6, 2008). "FAQ: What does the iPhone SDK mean?". CNET. CBS Interactive. Retrieved June 21, 2017. ^ a b Kim, Arnold (March 6, 2008). "Apple Releases iPhone SDK, Demos Spore, Instant Messaging". MacRumors. Retrieved June 21, 2017. ^ Mayo, Benjamin (September 11, 2015). "Apple now allowing developers to submit iOS 9, OS X El Capitan and native Watch apps to the App Store". 9to5Mac. Retrieved June 21, 2017. ^ Sande, Steven (June 10, 2013). "New iOS SDK features for developers". Engadget. AOL. Retrieved June 21, 2017. ^ Sinicki, Adam (June 9, 2016). "Developing for Android vs developing for iOS – in 5 rounds". Android Authority. Retrieved June 21, 2017. ^ Paul, Ryan (September 15, 2009). "MonoTouch drops .NET into Apple's walled app garden". Ars Technica. Condé Nast. Retrieved June 21, 2017. ^ Dove, Jackie (April 11, 2010). "Adobe unleashes Creative Suite 5". Macworld. International Data Group. Retrieved June 21, 2017. ^ Mackenzie, Tim (May 7, 2012). "App store fees, percentages, and payouts: What developers need to know". TechRepublic. CBS Interactive. Retrieved December 21, 2017. ^ Frank, Blair Henry (June 8, 2015). "Apple frees casual iOS developers of membership requirement". PC World. International Data Group. Retrieved December 21, 2017. ^ Bohn, Dieter (December 20, 2017). "Apple will waive developer fees for nonprofits and governments in 2018". The Verge. Vox Media. Retrieved December 21, 2017. ^ a b Perez, Sarah (December 20, 2017). "Apple revises its controversial guidelines on template-based apps". TechCrunch. Oath Inc. Retrieved December 21, 2017. ^ "Choosing a Business Model". Apple Developer. Apple Inc. Retrieved June 27, 2017. ^ Halliday, Josh (February 15, 2011). "Apple launches subscription service for magazines, newspapers and music". The Guardian. Guardian Media Group. Retrieved March 29, 2017. ^ Chartier, David (February 15, 2011). "Apple launches long-awaited subscriptions for App Store". Macworld. International Data Group. Retrieved March 29, 2017. ^ Kafka, Peter (June 8, 2016). "The app boom is over". Recode. Vox Media. Retrieved June 27, 2017. ^ a b Austin, Alex (June 21, 2016). "The Apple App Store graveyard". TechCrunch. AOL. Retrieved June 27, 2017. ^ a b Newton, Casey (March 2, 2016). "Life and death in the App Store". The Verge. Vox Media. Retrieved June 27, 2017. ^ Frommer, Dan (August 22, 2014). "Most smartphone users download zero apps per month". Quartz. Atlantic Media. Retrieved June 27, 2017. ^ Clover, Juli (June 8, 2016). "Apple Announces Major App Store Changes Including New Subscription Terms and Search Ads". MacRumors. Retrieved March 29, 2017. ^ Perez, Sarah (October 20, 2016). "China overtakes the U.S. in iOS App Store revenue". TechCrunch. AOL. Retrieved June 27, 2017. ^ Broussard, Mitchel (October 21, 2016). "China 'Shatters' Records and Overtakes U.S. in App Store Revenue by 15% Margin". MacRumors. Retrieved June 27, 2017. ^ Rossignol, Joe (June 1, 2017). "Apple Says Developers Have Earned Over $70 Billion From App Store Since It Launched". MacRumors. Retrieved June 2, 2017. ^ Lunden, Ingrid (June 1, 2017). "Apple passes $70B in app developer payouts, led by games and entertainment". TechCrunch. AOL. Retrieved June 2, 2017. ^ a b c "iPhone App Store Downloads Top 10 Million in First Weekend". Apple Press Info. Apple Inc. July 14, 2008. Retrieved March 29, 2017. ^ a b c "App Store Downloads Top 100 Million Worldwide". Apple Press Info. Apple Inc. September 9, 2008. Retrieved March 29, 2017. ^ a b c Siegler, MG (June 8, 2009). "State Of The iPhone Ecosystem: 40 Million Devices and 50,000 Apps". TechCrunch. AOL. Retrieved March 29, 2017. ^ a b "Apple Announces Over 100,000 Apps Available on the App Store". MacRumors. November 4, 2009. Retrieved March 29, 2017. ^ a b c Brian, Matt (August 28, 2010). "Apple's App Store Now Features 250,000 Apps". The Next Web. Retrieved March 29, 2017. ^ a b c d Grothaus, Michael (October 4, 2011). "More than 18 billion apps downloaded from App Store". Engadget. AOL. Retrieved March 31, 2017. ^ a b c Ingraham, Nathan (October 22, 2013). "Apple announces 1 million apps in the App Store, more than 1 billion songs played on iTunes radio". The Verge. Vox Media. Retrieved March 31, 2017. ^ a b c d Golson, Jordan (June 13, 2016). "Apple's App Store now has over 2 million apps". The Verge. Vox Media. Retrieved March 31, 2017. ^ a b c d "Apple's Revolutionary App Store Downloads Top One Billion in Just Nine Months". Apple Press Info. Apple Inc. April 24, 2009. Retrieved March 29, 2017. ^ a b McCarthy, Caroline (July 15, 2008). "Apple: One million iPhones sold, 10 million App Store downloads in first weekend". CNET. CBS Interactive. Retrieved March 31, 2017. ^ a b Myslewski, Rik (January 16, 2009). "iPhone App Store breezes past 500 million downloads". The Register. Situation Publishing. Retrieved March 29, 2017. ^ a b Schonfeld, Erick (March 17, 2009). "Apple Opens Up More Ways To Get Paid On The iPhone, Adds Key New Features. Apps Hit 800 Million Downloads". TechCrunch. AOL. Retrieved March 29, 2017. ^ June, Laura (July 14, 2009). "Apple's App Store crosses the 1.5 billion download mark". Engadget. AOL. Retrieved March 29, 2017. ^ a b c "Apple's App Store Downloads Top Two Billion". Apple Press Info. Apple Inc. September 28, 2009. Retrieved March 29, 2017. ^ "Apple announces App Store downloads top 2 billion". AppleInsider. September 28, 2009. Retrieved March 29, 2017. ^ "Apple Announces Over 100,000 Apps Now Available on the App Store". Apple Press Info. Apple Inc. November 4, 2009. Retrieved March 29, 2017. ^ a b Siegler, MG (February 12, 2010). "App Store Now Has 150,000 Apps. Great News For The iPad: Paid Books Rule". TechCrunch. AOL. Retrieved March 29, 2017. ^ a b Slivka, Eric (January 5, 2010). "Apple Announces 3 Billion App Store Downloads". MacRumors. Retrieved March 29, 2017. ^ "Apple's App Store Downloads Top Three Billion". Apple Press Info. Apple Inc. January 5, 2010. Retrieved March 29, 2017. ^ a b c "Apple says App Store has made developers over $1 billion". AppleInsider. June 7, 2010. Retrieved March 29, 2017. ^ Elmer-DeWitt, Philip (August 28, 2010). "Apple App Store: 250,000 and counting". Fortune. Time Inc. Retrieved March 29, 2017. ^ Rao, Leena (September 1, 2010). "Jobs: 6.5 Billion Apps Downloaded From The App Store". TechCrunch. AOL. Retrieved March 29, 2017. ^ Snell, Jason (October 18, 2010). "Jobs speaks! The complete transcript". Macworld. International Data Group. Retrieved March 29, 2017. ^ Tsotsis, Alexia (October 20, 2010). "App Store Hits 7 Billion Downloads". TechCrunch. AOL. Retrieved March 30, 2017. ^ a b "Apple's App Store Downloads Top 10 Billion". Apple Press Info. Apple Inc. January 22, 2011. Retrieved March 30, 2017. ^ Oliver, Sam (January 22, 2011). "Apple reaches 10 billion downloads on the iOS App Store". AppleInsider. Retrieved April 19, 2017. ^ a b Rao, Leena (July 7, 2011). "Apple's App Store Crosses 15B App Downloads, Adds 1B Downloads In Past Month". TechCrunch. AOL. Retrieved March 30, 2017. ^ a b "Apple's App Store Downloads Top 15 Billion". Apple Press Info. Apple Inc. July 7, 2011. Retrieved March 30, 2017. ^ a b Hardawar, Devindra (October 4, 2011). "Apple has sold over 250M iOS devices, 18 billion apps". VentureBeat. Retrieved March 31, 2017. ^ Slivka, Eric (March 2, 2012). "Apple's App Store Reaches 25 Billion Downloads, Now on Pace for 15 Billion Apps Per Year". MacRumors. Retrieved March 31, 2017. ^ a b c Reisinger, Don (June 11, 2012). "Apple: 30B apps downloaded, 400M App Store accounts set up". CNET. CBS Interactive. Retrieved March 31, 2017. ^ Etherington, Darrell (September 12, 2012). "iOS App Store Boasts 700K Apps, 90% Downloaded Every Month". TechCrunch. AOL. Retrieved March 31, 2017. ^ a b Islam, Zak (January 8, 2013). "Apple App Store Surpasses 40 Billion Downloads". Tom's Hardware. Purch Group. Retrieved April 19, 2017. ^ a b c Lomas, Natasha (January 7, 2013). "Apple App Store: 40B Downloads And Counting; 2B+ In December, ~20B In 2012". TechCrunch. AOL. Retrieved March 31, 2017. ^ "App Store Tops 40 Billion Downloads with Almost Half in 2012". Apple Press Info. Apple Inc. January 7, 2013. Retrieved March 31, 2017. ^ a b "Apple Updates iOS to 6.1". Apple Press Info. Apple Inc. January 28, 2013. Retrieved March 31, 2017. ^ Heisler, Yoni (April 24, 2013). "Apple has paid out $9 billion to developers; App Store downloads reach 45 billion". Engadget. AOL. Retrieved March 31, 2017. ^ "Apple's App Store Marks Historic 50 Billionth Download". Apple Press Info. Apple Inc. May 16, 2013. Retrieved March 31, 2017. ^ Baldwin, Roberto (May 15, 2013). "Apple Hits 50 Billion Apps Served". Wired. Condé Nast. Retrieved March 31, 2017. ^ Lowensohn, Josh (May 15, 2013). "Apple's App Store downloads hit 50 billion". CNET. CBS Interactive. Retrieved March 31, 2017. ^ a b Perez, Sarah (June 10, 2013). 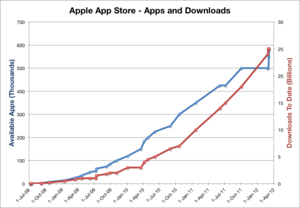 "Apple's App Store Hits 50 Billion Downloads, 900K Apps, $10 Billion Paid To Developers; iTunes Now With 575M Accounts". TechCrunch. AOL. Retrieved March 31, 2017. ^ a b H., Victor (June 10, 2013). "Apple App Store reaches 900 000 apps". PhoneArena. Retrieved March 31, 2017. ^ a b Perton, Marc (October 22, 2013). "Apple App Store hits 60 billion cumulative downloads". Engadget. AOL. Retrieved April 19, 2017. ^ a b c d Perez, Sarah (June 2, 2014). "iTunes App Store Now Has 1.2 Million Apps, Has Seen 75 Billion Downloads To Date". TechCrunch. AOL. Retrieved March 31, 2017. ^ Summers, Nick (September 9, 2014). "The App Store now boasts 1.3 million iOS apps". The Next Web. Retrieved March 31, 2017. ^ Perez, Sarah (September 9, 2014). "iTunes App Store Reaches 1.3 Million Mobile Applications". TechCrunch. AOL. Retrieved March 31, 2017. ^ a b Ranger, Steve (January 8, 2015). "Apple's App Store developer revenue hits $25bn as Apple touts job creation". ZDNet. CBS Interactive. Retrieved March 31, 2017. ^ "App Store Rings in 2015 with New Records". Apple Press Info. Apple Inc. January 8, 2015. Retrieved March 31, 2017. ^ a b Lunden, Ingrid (June 8, 2015). "iTunes App Store Passes 1.5M Apps, 100B Downloads, $30B Paid To Developers To Date". TechCrunch. AOL. Retrieved March 31, 2017. ^ Ingraham, Nathan (June 8, 2015). "Apple's App Store has passed 100 billion app downloads". The Verge. Vox Media. Retrieved March 31, 2017. ^ Broussard, Mitchel (June 8, 2015). "App Store Surpasses 100 Billion Lifetime Downloads". MacRumors. Retrieved March 31, 2017. ^ a b c Perez, Sarah (June 13, 2016). "Apple's App Store hits 2M apps, 130B downloads, $50B paid to developers". TechCrunch. AOL. Retrieved March 31, 2017. ^ a b c Beck, Kellen (June 13, 2016). "Apple's App Store now has over 2 million apps". Mashable. Retrieved March 31, 2017. ^ Goode, Lauren (January 5, 2017). "Apple's App Store just had the most successful month of sales ever". The Verge. Vox Media. Retrieved March 31, 2017. ^ Broussard, Mitchel (January 5, 2017). "App Store Sets New Records With $240M in Sales on New Year's Day, $20B Paid to Developers in 2016". MacRumors. Retrieved March 31, 2017. ^ Gross, Doug (March 5, 2010). "Apple's iPad to be released April 3". CNN. Retrieved April 1, 2017. ^ "Apple iPad launch day". CNET. CBS Interactive. April 3, 2010. Retrieved April 1, 2017. ^ a b Rao, Leena (April 4, 2010). "The App Store Now Has Over 3,000 iPad Apps, Only 20 Percent Are Free". TechCrunch. AOL. Retrieved April 1, 2017. ^ a b c Ranger, Steve (January 16, 2015). "iOS versus Android. Apple App Store versus Google Play: Here comes the next battle in the app wars". ZDNet. CBS Interactive. Retrieved April 1, 2017. ^ Dredge, Stuart (September 25, 2011). "The top 50 iPad apps". The Guardian. Guardian Media Group. Retrieved April 1, 2017. ^ "Apple's App Store Downloads Top 15 Billion". Apple Press Info. Apple Inc. July 7, 2011. Retrieved April 1, 2017. ^ McCracken, Harry (November 14, 2011). "iOS vs. Android: Lots of stats, little clarity". CNET. CBS Interactive. Retrieved April 1, 2017. ^ Perez, Sarah (October 22, 2013). "1 Million+ Apps Later, Apple Says Developers Have Made $13 Billion On Its Platform". TechCrunch. AOL. Retrieved April 1, 2017. ^ Kastrenakes, Jacob (March 21, 2016). "There are now 1 million iPad apps". The Verge. Vox Media. Retrieved April 1, 2017. ^ Eadicicco, Lisa (December 6, 2016). "These Are the Most Popular iPhone Apps of 2016". Time. Retrieved June 11, 2017. ^ Bell, Karissa (December 7, 2016). "Apple just revealed the most-downloaded app of 2016". Mashable. Retrieved June 11, 2017. ^ a b Warren, Christina. "Apple names the best iOS apps of 2015". Mashable. Retrieved January 19, 2019. ^ a b "These Are the Most Popular iPhone Apps of 2016". Time. Retrieved August 22, 2018. ^ a b Bell, Karissa. "Apple's most downloaded apps of 2017". Mashable. Retrieved August 22, 2018. ^ a b month, Karissa Bell 1; Weeks, 2 (December 4, 2018). "Apple reveals the most popular iPhone apps of 2018". Mashable India. Retrieved January 19, 2019. ^ Potuck, Michael (July 2, 2018). "These are the all-time most popular iOS apps and games from 2010-2018". 9to5Mac. Retrieved January 19, 2019. ^ a b "These are the all-time most popular iOS apps and games from 2010-2018". 9to5Mac. July 2, 2018. Retrieved August 22, 2018. ^ Cox, John (August 18, 2013). ""Jekyll" test attack sneaks through Apple App Store, wreaks havoc on iOS". Network World. Archived from the original on January 2, 2014. Retrieved June 20, 2014. ^ Talbot, David (August 15, 2013). "Remotely Assembled Malware Blows Past Apple's Screening Process | MIT Technology Review". Technologyreview.com. Retrieved June 20, 2014. ^ Mayo, Benjamin (June 9, 2017). "App Store now requires developers to use official API to request app ratings, disallows custom prompts". 9to5Mac. Retrieved June 14, 2017. ^ Kastrenakes, Jacob (June 9, 2017). "Apple won't let apps annoy you with their own review prompts anymore". The Verge. Vox Media. Retrieved June 14, 2017. ^ Dillet, Romain (June 7, 2017). "The new iOS App Store lets devs choose whether or not to reset ratings when updating". TechCrunch. AOL. Retrieved June 14, 2017. ^ Constine, Josh (June 9, 2017). "Apple legalizes and taxes in-app tipping for content creators". TechCrunch. AOL. Retrieved June 14, 2017. ^ Rossignol, Joe (June 9, 2017). "Apple Officially Allows Users to Tip Content Creators With In-App Purchases". MacRumors. Retrieved June 14, 2017. ^ Gera, Emily (November 26, 2012). "Boyfriend Maker gets pulled from App Store for references to paedophilia". Polygon. Vox Media. Retrieved June 11, 2017. ^ Hamilton, Kirk (April 24, 2013). "Bizarre Boyfriend Maker Is Back On The App Store, Slightly Declawed". Kotaku. Univision Communications. Retrieved June 11, 2017. ^ Golson, Jordan (March 11, 2013). "'HiddenApps' Hides Stock Apps, iAds and More on Non-Jailbroken iOS Devices [Update: Removed]". MacRumors. Retrieved June 11, 2017. ^ Cipriani, Jason (March 11, 2013). "HiddenApps hides stock Apple apps on your iOS device". CNET. CBS Interactive. Retrieved June 11, 2017. ^ Koetsier, John (April 8, 2013). "Apple pulls AppGratis from app store 2 months after it raised $13.5M in funding". VentureBeat. Retrieved June 11, 2017. ^ Paczkowski, John (April 8, 2013). "Confirmed: Apple Kicks AppGratis Out of the Store for Being Too Pushy". All Things Digital. Dow Jones & Company. Retrieved June 11, 2017. ^ Koetsier, John (April 8, 2013). "Pulled iOS app AppGratis is 'welcome to resubmit'". VentureBeat. Retrieved June 11, 2017. ^ Huddleston Jr., Tom (February 13, 2015). "Apple's ban on marijuana social networking app goes up in smoke". Fortune. Time Inc. Retrieved June 11, 2017. ^ Vincent, James (February 13, 2015). "Banned weed app returns to the Apple store with new location restrictions". The Verge. Vox Media. Retrieved June 11, 2017. ^ Mayo, Benjamin (September 20, 2015). "Hundreds of apps infected by fake Xcode tools, Apple removing known malicious software from App Store". 9to5Mac. Retrieved April 1, 2017. ^ Finkle, Jim (September 20, 2015). "Apple's iOS App Store suffers first major attack". Reuters. Thomson Reuters. Retrieved April 1, 2017. ^ Van Boom, Daniel (September 21, 2015). "Apple cleanses App Store of tainted iPhone, iPad software". CNET. CBS Interactive. Retrieved April 1, 2017. ^ Lovejoy, Ben (September 21, 2015). "Security firm publishes list of some of the iOS apps infected by XcodeGhost – including Angry Birds 2 [Update: more apps]". 9to5Mac. Retrieved April 1, 2017. ^ Epstein, Zach (September 21, 2015). "85 legitimate iPhone apps that were infected with malware in the big App Store hackImage". BGR. Penske Media Corporation. Retrieved April 1, 2017. ^ Van Boom, Daniel (September 22, 2015). "Apple taking steps to prevent another large-scale App Store breach". CNET. CBS Interactive. Retrieved April 1, 2017. ^ Williams, Owen (September 22, 2015). "Apple asks developers to ensure their Xcode install isn't infected". The Next Web. Retrieved April 1, 2017. ^ Hardwick, Tim (June 12, 2017). "Report Reveals In-App Purchase Scams in the App Store". MacRumors. Retrieved June 27, 2017. ^ Miller, Chance (June 10, 2017). "Report details how scammers are abusing App Store & Search Ads". 9to5Mac. Retrieved June 27, 2017. ^ Smith, Brett (May 26, 2010). "More about the App Store GPL Enforcement". Free Software Foundation. Retrieved July 8, 2017. ^ Murphy, David (January 8, 2011). "Apple Pulls VLC Player from App Store Due to GPL". PC Magazine. Ziff Davis. Retrieved July 8, 2017. ^ Juli Clover (September 1, 2016). "Apple to Clean Up App Store, Eliminate Outdated and Non-Functional Apps". MacRumors. Retrieved January 5, 2017. ^ Chris Welch (September 1, 2016). "Apple will start removing abandoned apps from the App Store this month". The Verge. Vox Media. Retrieved January 5, 2017. ^ Perez, Sarah (November 15, 2016). "Apple's big App Store purge is now underway". TechCrunch. AOL. Retrieved November 27, 2016. ^ Clover, Juli (November 15, 2016). "Apple Removed 47,300 Outdated iOS Apps From App Store in October of 2016". MacRumors. Retrieved November 27, 2016. ^ Panzarino, Matthew (June 21, 2017). "Apple goes after clones and spam on the App Store". TechCrunch. AOL. Retrieved June 27, 2017. ^ Miller, Chance (June 21, 2017). "Apple ramping up App Store cleaning efforts, has already removed 'hundreds of thousands' of apps". 9to5Mac. Retrieved June 27, 2017. ^ Perez, Sarah (December 8, 2017). "Apple's widened ban on templated apps is wiping small businesses from the App Store". TechCrunch. Oath Inc. Retrieved December 12, 2017. ^ Miller, Chance (December 8, 2017). "Report: Apple cracking down on template applications, giving developers January 1 deadline". 9to5Mac. Retrieved December 12, 2017. ^ Clover, Juli (December 20, 2017). "Apple Updates App Store Guidelines to Relax Restrictive Rules on Template Apps". MacRumors. Retrieved December 21, 2017. ^ Vincent, James (January 5, 2017). "Apple removes New York Times app from China's app store at government's request". The Verge. Vox Media. Retrieved December 6, 2017. ^ Haas, Benjamin (January 5, 2017). "Apple removes New York Times app in China". The Guardian. Guardian Media Group. Retrieved December 6, 2017. ^ Russell, Jon (July 29, 2017). "Apple removes VPN apps from the App Store in China". TechCrunch. Oath Inc. Retrieved November 8, 2017. ^ Choudhury, Saheli Roy (July 31, 2017). "Apple removes VPN apps in China as Beijing doubles down on censorship". CNBC. NBCUniversal News Group. Retrieved November 8, 2017. ^ Panzarino, Matthew (July 30, 2017). "Apple issues statement regarding removal of unlicensed VPN apps in China". TechCrunch. Oath Inc. Retrieved December 6, 2017. ^ Mozur, Paul (July 29, 2017). "Apple Removes Apps From China Store That Help Internet Users Evade Censorship". The New York Times. Retrieved November 8, 2017. ^ Horwitz, Josh (August 2, 2017). "Tim Cook is defending Apple's removal of VPN apps from its Chinese app store with a familiar refrain". Quartz. Atlantic Media. Retrieved November 8, 2017. ^ "Skype removed from China Apple and Android app stores". BBC News. BBC. November 22, 2017. Retrieved December 5, 2017. ^ "Skype Disappears From Chinese App Stores in Latest Web Crackdown". Bloomberg Technology. Bloomberg. November 21, 2017. Retrieved December 6, 2017. ^ Mozur, Paul (November 21, 2017). "Skype Vanishes From App Stores in China, Including Apple's". The New York Times. Retrieved December 5, 2017. ^ Lovejoy, Ben (November 21, 2017). "Apple removes Skype from Chinese app store after request from Ministry of Public Security". 9to5Mac. Retrieved December 6, 2017. ^ Rossignol, Joe (November 21, 2017). "Apple Has Removed Skype From App Store in China to Comply With Local Law". MacRumors. Retrieved December 6, 2017. ^ Denyer, Simon (December 4, 2017). "Apple CEO backs China's vision of an 'open' Internet as censorship reaches new heights". The Washington Post. Retrieved December 6, 2017. ^ Balakrishnan, Anita (December 5, 2017). "Apple has a 'moral obligation' to push back in China, says senator who probed the company's ties". CNBC. NBCUniversal News Group. Retrieved December 6, 2017. ^ Miller, Chance (December 5, 2017). "U.S. Senator Leahy says Apple has 'moral responsibility' to fight oppression in China". 9to5Mac. Retrieved December 6, 2017. ^ "Apple's Cook optimistic that apps pulled in China will be back". Reuters. Thomson Reuters. December 6, 2017. Retrieved December 6, 2017. ^ Russell, Jon (December 6, 2017). "For some reason Tim Cook thinks China will allow VPNs to return to the App Store". TechCrunch. Oath Inc. Retrieved December 6, 2017. ^ Miller, Chance (December 13, 2017). "Marco Rubio slams Tim Cook for Apple's 'desperate' relationship with China". 9to5Mac. Retrieved December 14, 2017. ^ "Apple removes 25,000 'illegal' apps from App Store in China". The Verge. Retrieved August 20, 2018. ^ Choudhury, Saheli Roy (August 20, 2018). "Apple reportedly yanked 25,000 apps from its China App Store". CNBC. Retrieved August 20, 2018. This page was last edited on 31 March 2019, at 18:52 (UTC).